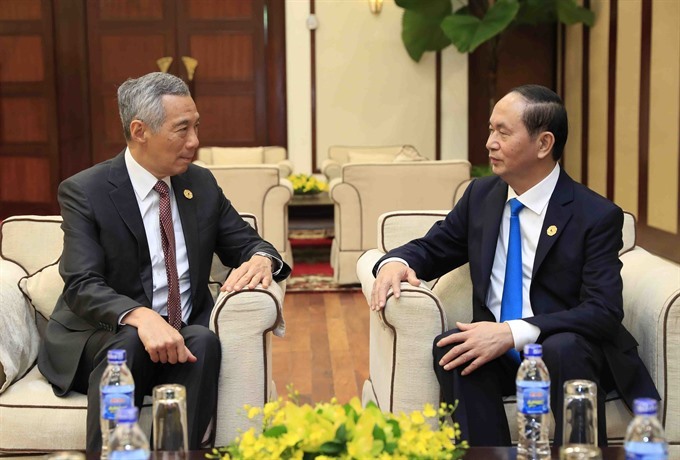 ĐÀ NẴNG — President Trần Đại Quang has reassured Singaporean Prime Minister Lee Hsien Loong that Việt Nam always encourages Singaporean companies to invest in the country. At a meeting on the sidelines of ongoing APEC Economic Leaders’ Meeting in central Đà Nẵng City on Friday, the two leaders shared their delight at the progress of the Việt Nam-Singapore Strategic Partnership, especially after President Quang’s visit to Singapore in August 2016 and PM Lee’s trip to Việt Nam in March 2017. They also agreed to coordinate closely in preparing celebrations for the 45th founding anniversary of diplomatic ties. PM Lee urged Việt Nam to back Singapore as the ASEAN Chair next year and create more favourable conditions for Singaporean enterprises and investors to do business effectively in Việt Nam. The two leaders spoke highly of the strong development of people-to-people exchanges and cooperation in culture and education between Việt Nam and Singapore.